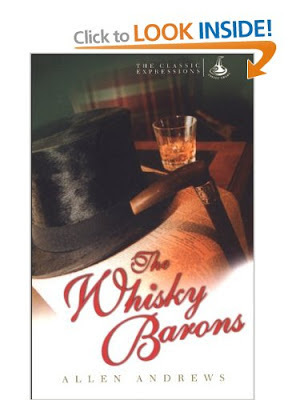 A few months ago I picked up a copy of The Whisky Barons for the bargain price of 99 pence in one of Amazon's ebook sales. It said on my Kindle unread until a couple of weeks ago when I read it while on holiday. The book has rather grand aims, seeking to explain how the "Whisky Barons" changed the face of the industry in the late 18th and early 19th centuries. The book is roughly divided into four sections. The first two sections tell the story of Jimmy Buchanan and Tom Dewar who had great success in marketing their own brands of whisky. The Buchanan Blend and Black and White in the case of Jimmy and Dewars in the case of Tom. The author probably wouldn't like me saying so, but I found their stories remarkably similar. Up until the late 18th Century the majority of whisky had been single malt and pretty variable in quality. The both produced blended whiskies which were more constant and tuned to the taste of the time. Through clever marketing strategies and world tours they were able to take their brands into the big league. Buchanan and Dewar merged their brands in 1915 and subsequently became part of the Diageo stable. While the first two sections of the book weren't particularly exciting or insightful, the third section of the book got a little more interesting, telling the story of James Mackie. The Mackie family owner a number of distilleries, including Lagavulin on Islay. Also spotting the need for a blended whisky James produced White Horse which is still available today was was awarded best blended whisky by Jim Murray in 2007. Mackie was a driving force in the legislation in defining what can and cannot be called a whisky that still exists today. The final section of the book was the most interesting. It details the story of The Berry Brothers, their Cutty Sark blend and American prohibition. UK distributers, including Berry Brothers, sold their whisky to merchants in Nassau. The merchants in turn would sell the whisky to seaman who would sail as close to the US as possible, while being careful to stay in international waters. Whisky runners from the US would sail out to the floating ships to purchase whisky and illegally import it into the US. They were swashbuckling and exciting times and the book does a good job of giving you a taste of what it must have been like in Nassau. Overall I didn't find the book particularly revelatory. It started with style of writing that was flowery and slightly annoying. However, after the first chapter I got used to the style of the author and by the end of the book was quite enjoying learning about how whisky helped to break prohibition in America. I read most of the book while waiting to change planes in Nairobi airport. To help break the boredom of an eight hour layover I paid to use one of the business class lounges. While I was reading I noticed they had a bottle of Mackie's White Horse open. I had a small dram which was a good accompaniment to the book.